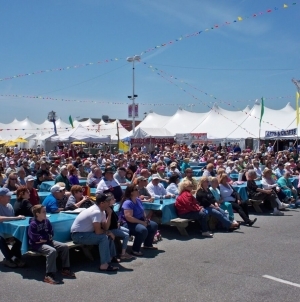 (May 1, 2015) Residents and visitors alike know summer is only a short time away when Springfest returns to Ocean City next week, featuring four fun-filled days of food, live entertainment and arts and crafts vendors under huge tents in the inlet parking lot. The first 500 moms to enter Springfest will receive a button pin with the 25th anniversary logo and a carnation. 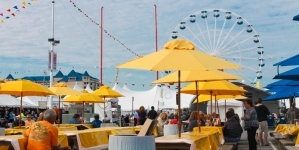 The festival traditionally rings in the start of the summer season at the beach and will take place May 7-10. Admission is free to Springfest, except for a couple headlining musical acts that require tickets. Springfest kicks off Thursday, May 7, at 10 a.m. in the entertainment pavilion with the Stephen Decatur High School Choir singing the National Anthem, Junior ROTC posting colors and a performance from the OC Stars. Mayor Rick Meehan will conclude the program with a ribbon-cutting ceremony, which will officially open Springfest to the public. 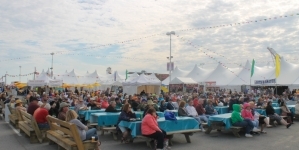 Thousands of people from all across the country come out to browse the 184 unique craft booths, eat at one of the 30 food vendors or listen to dozens of free concerts. Last year, the event drew a crowd of 102,221. Miller said depending on the weather, the attendance numbers are usually above 100,000 people. The best year Springfest had was in 2004, when 118,000 came out to the four-day festival, he added. There will be plenty of activities for children including inflatable bounce houses and a rock climbing wall. 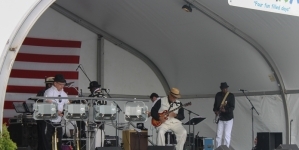 Dozens of free musical performances will be taking place all weekend from dancers to jazz and blues music. The fifth annual Band Jam will take place next Thursday at 5 p.m. where local musicians get together on the Springfest stage and jam out together. This year’s jam band line-up includes Kevin Poole, Joe Smooth, John Remy, Joe Mama, Mike Armstrong, Lauren Glick and Jeff Davis. Headlining acts start off with a performance from Beatlemania Again on Thursday night at 7 p.m., and tickets are still available for $10-15. Tickets can be purchased by calling 1-800-551-7328, on site at the festival’s ticket booth or through Ticketmaster.com. On Friday, May 8, a sold-out performance by country music star Vince Gill will begin at 8 p.m. He has won 18 CMA honors and eight ACM awards. Since 1990, Gill has received 20 Grammys and has sold more than 26 million albums. Gill was inducted into the County Music Hall of Fame in 2007, is a member of the Grand Ole Opry and received a star on the Hollywood Walk of Fame in 2012. The final headlining act, Pat Benatar and Neil Giraldo, sold out on Monday and will be performing on Saturday, May 9, at 8 p.m.
Their Springfest concert is one stop on a 35th anniversary tour with ballads including “Love is a Battlefield,” “Hit Me With Your Best Shot” and “Heartbreaker.” They have sold more than 26 million albums and charted 19 Top 40 singles, earning four consecutive Grammy Awards and three American Music Awards. 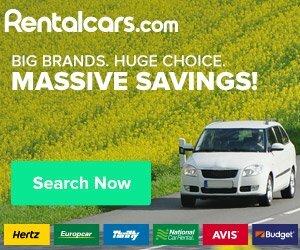 Since parking is limited in downtown Ocean City, shuttle buses will be offered to and from the West Ocean City Park and Ride on Route 50. For more information on the shuttle service, call the Ocean City Transportation Department at 410-723-1606. 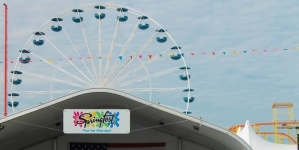 Springfest runs Thursday through Saturday, May 7-9, 10 a.m. to 8 p.m. and Sunday, May, 10, from 10 a.m. to 6 p.m.